Last week was a total bust. I was feeling great going into the week with yoga sessions, but I knew I was in trouble when I hadn't run by Wednesday and we were expecting the blizzard of the century. It turns out the blizzard would be the least of my worries. Notice I said Off instead of Rest? These weren't Rest Days. On Thursday, I got hit with crippling back pain as I mentioned this weekend. For the next three days, I couldn't get out of bed. I was in so much pain. Finally, on Sunday, not wanting to trek to the ER, I found a doctor to see who gave me a steroid injection along with some other meds and the relief was almost instant. I'm really bummed that I had to take so much time off of yoga. I'm so determined to do a 30-day yoga challenge, and this is the third time I've failed. There obviously wasn't much I could do, but I'm finally feeling better and hoping to get back on the mat and on the road soon. I will complete a 30-day yoga challenge. Maybe not this week, but I'm going to keep pushing through until I've done it and I know that regardless of how many times I have to start over, the simple task of trying to make it to the mat every day will make me a better, stronger runner. Right now, I just need to focus on getting well. How do you handle setbacks like this? 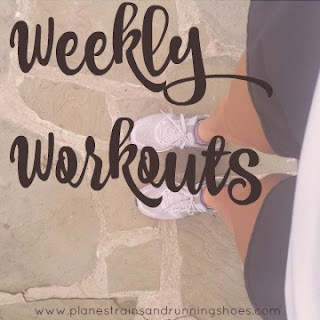 Today, I'm linking up with Tracy and Alyssa for Training for Tuesday!